Whether you’re just pondering getting pregnant, are already three weeks pregnant, or are on the precipice of delivery, you’re entering into exciting new waters. First off, a healthy pregnancy is based on a nutritious eating regimen, but prenatal vitamins can be helpful in fulfilling the drastically greater need for more nutrients you’ll have as a mother to be. Prenatal vitamins don’t replace a balanced diet, but sure do help ensure you don’t fall short of essential nutrients during your pregnancy. So, while you’re tossing around baby names in your head, another idea to explore and carefully consider is what sort of prenatal vitamin will suit you best. Whether it be one of the best prenatal vitamins with DHA, one with added folate, or an organic prenatal, there are many options to choose from to aid in fertility, reproductive, immunity, and digestive support. Why prenatal vitamins over regular multivitamins? Prenatal vitamins have more folic acid (to prevent spinal and birth defects) and iron (to increase the body’s oxygen supply for your little one) than multivitamins do. If you’re in the third trimester of your pregnancy, Vitamin D and calcium are important for building healthy bones and teeth for your baby, which you’re able to easily absorb through a prenatal multivitamin. Prenatal multivitamins also help with brain reserve, in reference to the brain tissue that helps us deal with brain stresses. The more reserves, the better for both baby and mother. If you support your own reserves, you’re preserving your baby’s, too. Other ways of increasing these reserves, aside from prenatals include decreasing stress levels, minimizing toxic exposure from pesticides and lead, and other environmental toxin ingredients from food, minimizing smoking and alcohol intake, and making sure to get enough Z’s. In an ideal world, it’s best to start taking them a month before conception and throughout your whole pregnancy. So, basically, from conception to birth is when you should take them. Even if you’re not planning to get pregnant, it’s still wise to take prenatals – it can’t hurt. The best time to take prenatal vitamins is anytime. If you’re even thinking about getting pregnant – the sooner you have the extra nutrients in your system the better, as they’re preparing your body for your future baby. What are the nutrients I should look for when selecting a prenatal? Folate or folic acid is important in preventing neural tube defects. Folic acid is derived from folate, and is a better form of Vitamin B9 that’s water-soluble. Iron is vital for hemoglobin (protein in red blood cells that carries oxygen) production. If levels of this are kept constant, the risk of anemia is lowered. Calcium is excellent for heart and bone development. Other important nutrients to have during pregnancy include Vitamin A (no more than 4,000 IU), Vitamin C (50-80 mg) which helps the body to absorb iron, Vitamin B6 (all you need is 2mg), and Vitamin B12. Omega-3 fatty acids are good to have in your diet, too if you have a bun in the oven, as they help with the baby’s brain and nervous system development. DHA, an Omega-3 fatty acid, is a fat found in fish has been found to be elemental with aiding in this process. It also immensely aids in brain, eye, and spinal development. Iodine is also important to have in your system if you’re pregnant, as it helps with your baby’s thyroid and brain development. A serving size of 15mg of zinc is ideal to support your immune system while preggers, too. Lastly, copper is an important mineral that your body uses to produce blood cells, which would be good for you and baby to have a constant flow of this in your diets. In what forms can I find prenatal vitamins? These vitamins normally come in either a soft-gel capsule, pill capsule, or in gummies. If you’re a soon to be mama that gets morning sickness, you may have trouble swallowing a pill, so you might opt for gummies. It’s really just a matter of your preference. The only downfall with the prenatal gummy is that you won’t find any with iron, so you’d have to just remember to incorporate a fair amount of spinach and greens in your diet for that deficit. If you end up not taking in enough nutrients through your food intake, you’ll be assured that you’ll be receiving the vitamins you need if you take a prenatal vitamin. It won’t replace a balanced diet, but it’s an assurance to know you’re at least reaching your nutritional goal. Vitamin B6 helps reduce nausea – if you take at least 10 mg of this vitamin for the first few weeks of pregnancy, you’re likely to experience less morning sickness. B12 deficiency is affiliated with lower birthweight and preterm birth, so taking a prenatal will ensure this doesn’t happen. Taking a prenatal has been linked with a lower risk of preterm birth. 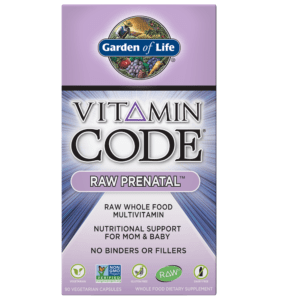 Garden of Life offers a Vitamin Code raw prenatal supplement, whole food, multi-nutrient formula that’s designed to meet the needs of soon-to-be mothers before conception, during pregnancy, and during lactation to give mother and baby a full array of nutrients needed for utmost health. These capsules have been blended with twenty-three fruit and vegetables. They also have probiotics and ginger in them to help with digestion, and zinc and Vitamin D to aid in immune system function. This brand supports blood and heart health with Vitamin C, Vitamin E, and B-complex vitamins, folate for healthy neural tube development, and in postnatal development. This formula is also infused with Vitamins A and C, copper, and iron for healthy skin and overall reproductive function, and is considered one of the best prenatal vitamins 2019 features. There are no artificial flavors, colors or fillers in this prenatal, and it’s non-GMO, gluten-free, and vegetarian. The suggested serving of these is three times a day with or without food. Lastly, these are some of the best prenatal vitamins at Whole Foods, if there’s one in your area. The Honest Company features a whole food based prenatal vitamin that is non-GMO and gluten-free, with 24 essential key vitamins and nutrients, hearty levels of folic acid, Vitamin D3, Iron, Choline, and B vitamins to help support your baby’s growth. This prenatal is full of Vitamin D, folic acid, ginger for digestion, and spirulina for those healthy B vitamins, and is chalked full of fruits and vegetables. Plus, these tablets are coated in natural vanilla that makes them easy to swallow. These are so gentle that they can be taken on an empty stomach, and they do have added digestive enzymes in these from pineapple, papaya, and kiwi to further facilitate digestion of the tablet. This vitamin has only 200 mg of calcium, so you may want to supplement with an additional source, or just make sure you’re receiving enough of this mineral through your diet. These are infused with micronutrients to reduce nausea, making it an easy vitamin to take any time of day. If you want the most spectrum of prenatal care routine, pair this with Honest Company’s Garden Complete. 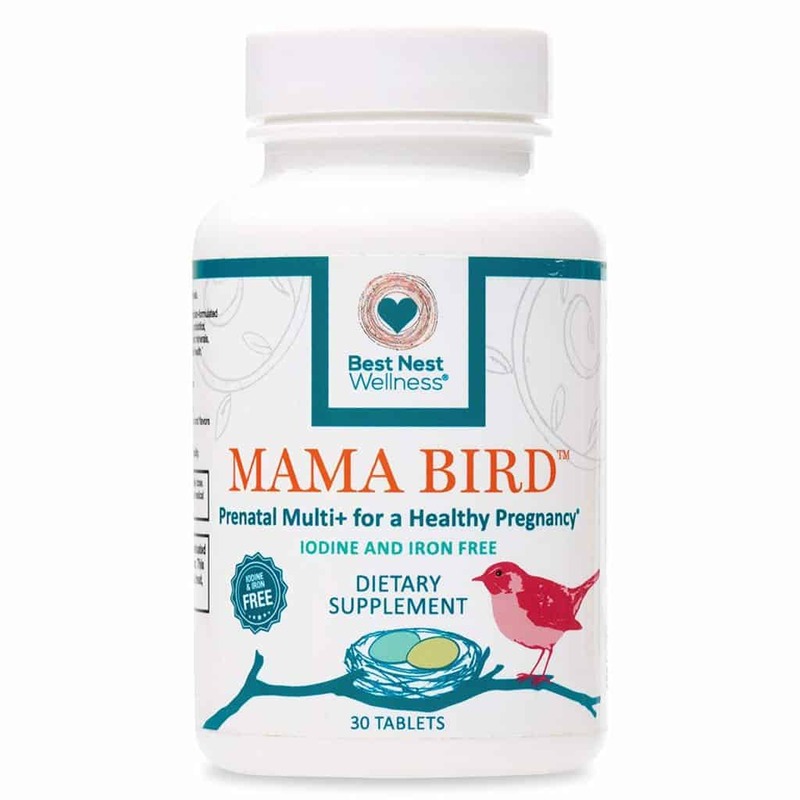 Mama Bird Prenatal Vitamin is special in that it is a vegan, gluten-free formula in tablet form that contains only methylated vitamins, which ensures you absorb and maximize the nutrients. This recipe contains methylated folate, which is even better than folic acid, as it’s the real deal banana peel stuff. It’s where the folic acid is extracted from. Folate is one of the more important nutrients to receive while you’re expecting, as it promotes neurological development. This blend has been blended with probiotics and digestive enzymes to improve digestion and absorption. It’s also been infused with organic chamomile, red raspberry leaf, and ginger to further facilitate these processes. This prenatal contains methylcobalamin, which is the most potent form of natural B12, natural B6, and vitamin D that comes from lichen, a plant source. This is also non-GMO, free of sugars, artificial fillers, and preservatives, and is made in the U.S.A.
You only need to take one a day so it’s easy to remember and make these a part of your daily routine. New Chapter offers a vegetarian prenatal tablet named Perfect Prenatal that has been fermented to enable the vitamins to become more easily absorbable into whole foods your body can utilize more efficiently. They have 13 vitamins and 10 minerals, and 21 herbs and botanicals that are safe to take for those that are pregnant. These are okay to take on an empty stomach in the morning if you’d like, as it has ginger and will quell any nausea you may have. 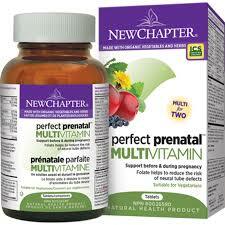 New Chapter Perfect Prenatal formulates these with a 100% daily value of non-constipating iron, B Vitamins for energy support, Vitamin D3 for heart function, Vitamins C, A, and zinc for immune health. There is also methylfolate in these for brain and spinal cord development. 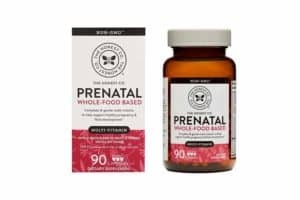 In addition, these have certified organic vegetables such as kale, broccoli, and cauliflower, and this brand is one of the best prenatal vitamins organic-wise. If you want Omega’s, DHA, and EPA, then you may consider adding in New Chapter’s WholeMega for Mom’s Fish Oil Supplement. This is also one of the best prenatal vitamins Walmart has available. 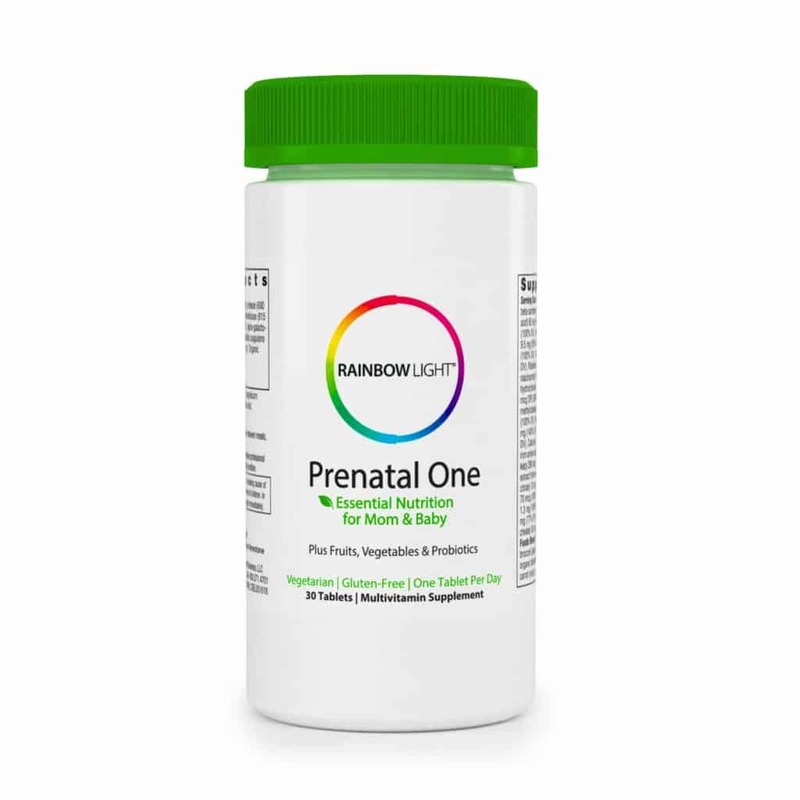 Rainbow Light offers a Prenatal One multivitamin instilled with superfoods and probiotics that is one of the best whole food prenatal vitamins offered in a 150-count supply that will last you about five months. Rainbow Light Prenatal is named so for the assortment of colorful fruits and vegetables the multivitamin contains, ranging from superfoods like spirulina, to broccoli, carrots, blueberries, kale, and beets. Rainbow Light supports a healthy digestive system function that’s packed full of plant-sourced enzymes for added benefit. There are no artificial colors, flavors, or fillers, wheat, gluten, or dairy, either. This is one of the best prenatal vitamins all natural has to offer. These contain 100% daily value of folate, calcium, choline, and iron. A feature of this product is that you only need one tablet a day, and it’s able to be used by both pregnant and nursing mothers. These have been considered some of the best prenatal vitamins 2018 had to offer, and still live up to their promise of being an effective prenatal. 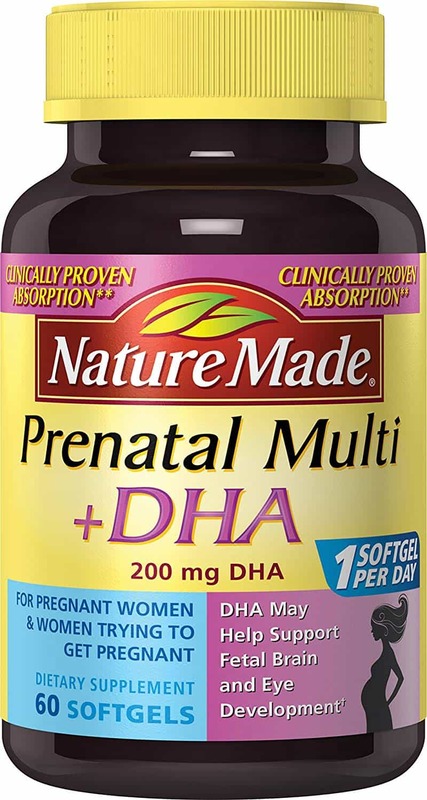 Nature Made Prenatal Multivitamin formulated with DHA is one of the best otc prenatal brands available that can be used both during pre and post pregnancy that’s designed to support you and baby for the long haul. These come in an easy to swallow soft-gel, for those that have a tough time swallowing pills. Nature Made prenatal features a gluten-free product with no synthetic dyes, colors, or fillers, with added Vitamin C for immune system support. These tablets have added magnesium for the nervous system, heart, and muscular system function, iron for red blood cell production, Vitamin A for healthy eyes, Calcium and Vitamin D3 or strong bones, folic acid, and B vitamins for energy support. Also, the 200 mg of DHA that these are infused with promotes healthy eyes and brain development. These are considered some of the best prenatal vitamins for hair growth, too, as they have Vitamin E.
Plus, it’s been clinically proven that the body actually absorbs all of these added vitamins, minerals, and nutrients in this blend. An added benefit of these is you only need to take them once a day. What are the best prenatal vitamins to take that are vegetarian? These ones! 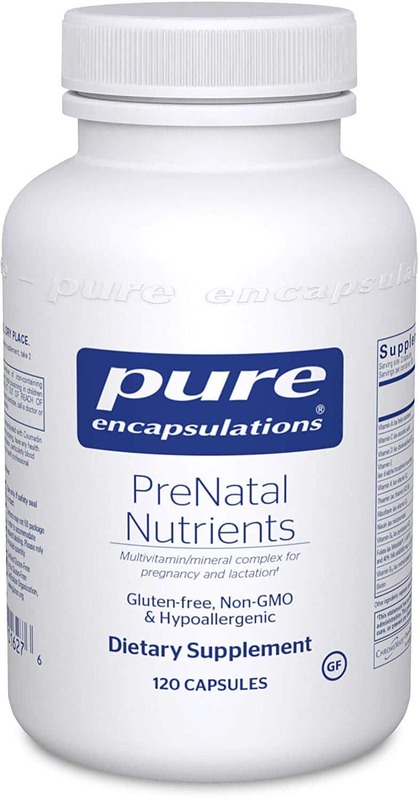 Made with raw and hypoallergenic ingredients, Pure Encapsulations features PreNatalNutrients that have been designed to support women of childbearing age, pregnant women, and women that are lactating. These support hormone, neurotransmitter, DNA, protein, and energy production as well as nervous system and cellular development. You can actually feel the boost in energy after you take them, and you will have enough to last you all day. Each serving contains one milligram of folic acid, which helps support healthy fetus and nervous system development. As the best prenatal vitamins with folate, these have riboflavin, pantothenic acid, niacin, vitamin B6, vitamin B12, beta carotene, lutein, zeaxanthin, and lycopene which allows for the body to naturally produce Vitamin A. The lutein and carotenoids help with eye health, and also produce antioxidants that serve as protection from free radicals that may cause harm to you and your baby. Mykind Organics Garden of Life offers a certified USDA organic raw probiotic blend with 4g of prebiotic fiber from the Acacia plant, 14 probiotic strains, and 50 billion CFU. These are one of the best vegan prenatal vitamins that’s designed to be used during pre-conception and during pregnancy and lactation. These have 21 essential vitamins and minerals, infused with 800 mg of folate and 18mg of iron. 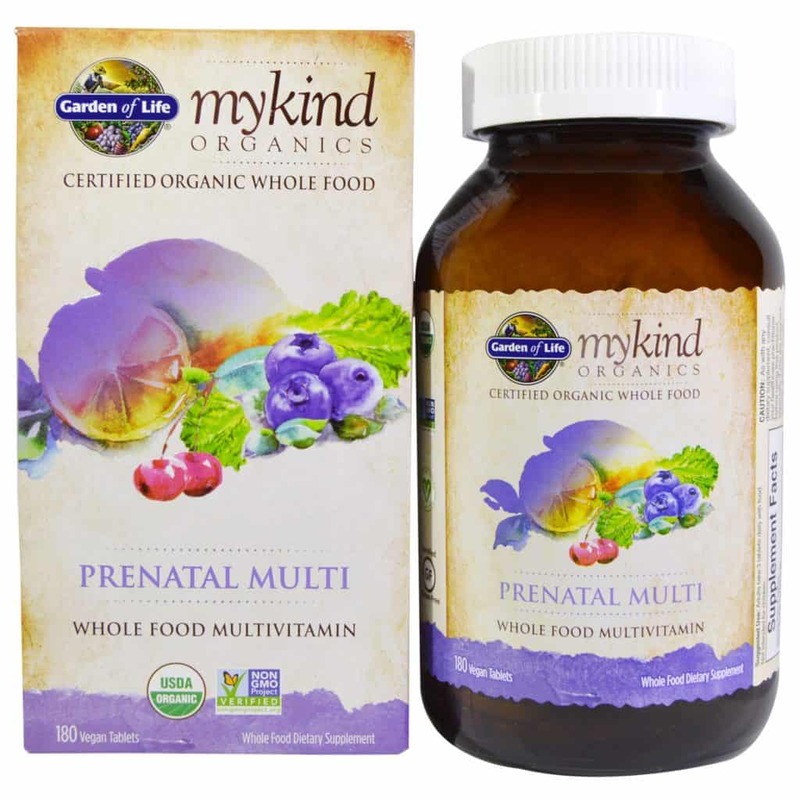 Mykind Organics supports energy, healthy digestion, and promotes healthy fetal development. These tablets are vegan, gluten-free, organic non-GMO, and have no artificial additives or binders. These are also infused with organic ginger and peppermint to reduce any nausea during those pregnant mornings. The suggested serving size is three times a day, which may be a little much for some to keep up with. Then again, you don’t necessarily have to take all three servings if you feel like it. These are made from over 30 powdered organic fruits, vegetables, and herbs, and with 150 mcg iodine from organic sea kelp. Garden of Life Mykind Organics is a high-quality brand that can be considered pricey by some, but you do get what you pay for. These are some of the best organic prenatal vitamins money can buy. What should I do if I feel nauseous while taking my prenatal multivitamin? Try taking it with a meal or snack just before you go to bed. Then you can just sleep off the pain if it does come, and eventually, you’ll just get used to it. What if I feel gassy after having my supplement? This could be due to a large amount of iron in the pills you are taking, which is probably more than you’re used to. Drink plenty of liquids, eat many fiber-rich foods, incorporate lots of physical activity throughout your day, or if you still don’t have any luck – try taking a supplement without iron if you continue to encounter problems. Should I take more supplements if I feel like I’m not receiving enough? Consult your health practitioner beforehand if you feel like you’re not getting enough nutrients, and also before using any herbs, as some can be harmful to fetuses. You also don’t want to overdo it and take too many. Whats the best prenatal vitamins brand? Seeing as how the best kinds are available as an over the counter item, you can choose whichever brand appeals to you most. You know what your body needs, so it’s a matter of choosing whatever calls out to you and going with that. Will I experience any side effects with prenatal multivitamins? Some females may feel slightly nauseous after taking them, but just take it before bed if this is an issue, or have a snack with it. If you have one that has iron in it, you may experience a little bit of constipation, but it’s nothing a few extra fluids and more fibrous foods can’t handle. How can I tell if a prenatal vitamin brand is trustworthy since it’s not regulated by the FDA? A seal from either the U.S. Pharmacopeia, NSF International, or ConsumerLab.com means it’s a reputable brand. This means they’ve been cross-checked for proper manufacturing, an accurate ingredient list, and have been verified to have no toxins or harmful ingredients. Another way to tell if you’re investing in a worthwhile bottle is to check to % daily value of each ingredient. Each one should be listed as 100%. It’s safer to choose a name brand vitamin, but if you opt for a generic brand – read the reviews prior to purchase. Whether you chose to go with Rainbow Light, or a brand like Mykind Organics, you can’t go wrong with any of these prenatal vitamin selections.